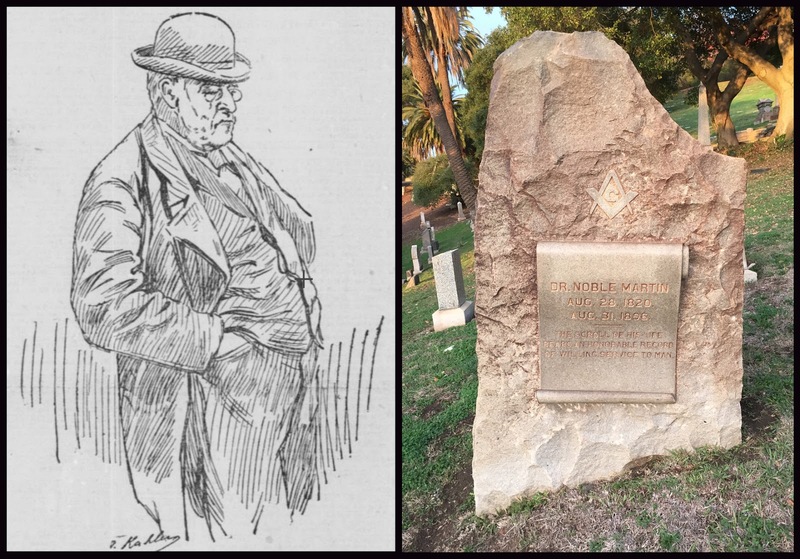 Dr. Noble Martin was a minister, doctor and a long-time member of the California Legislature. He was born in Vermont in 1820 as the third of nine boys. As a young man he worked on a farm and as a wagon maker. He came to California in 1852 to mine for gold. After finding only moderate success in the mines at Little York and Red Dog, he studied medicine and was a practicing physician for 25 years in Dutch Flat. The town, which is about 30 miles northeast of Auburn, was once one of the richest mining towns in California. The town is now designated as a "semi-ghost town" and has only 333 residents. He served in the California State Legislature for 25 years, serving Placer and El Dorado counties. He served on the Assembly Education Committee, where he was an outspoken advocate for creating kindergartens. * He served in the Senate from 1892 until his death. In 1892, he strongly supported his Republican friend George Perkins* for the United States Senate, despite being a lifelong Democrat. 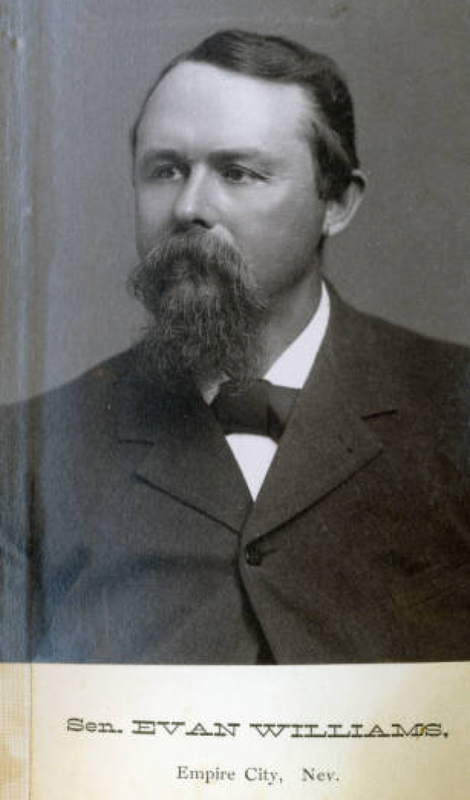 Perkins had served in the State Senate and as Governor of California from 1880-1883. He remained in the U.S. Senate for 22 years. Dr. Martin died at the home of his daughter in Berkeley after being in failing health. 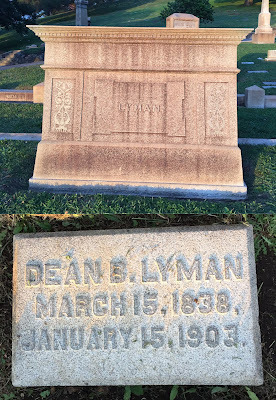 Dean Briggs Lyman was born in South Royalton, Vermont in 1838 and came to California in 1856, where he worked in the placer mines. He was married twice, first to the former Nellie Smith and later to Anna Dunlap, with whom he he had two children, Edward and George. He moved to Nevada and work in the quartz mills in Washoe City. 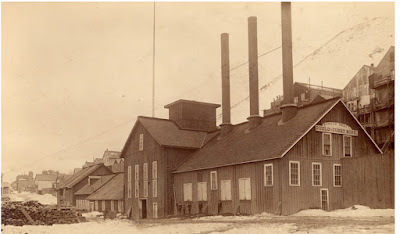 He went on to run the Morgan Mill in Ormsby and the Mexican Mill in Empire City (which was named for the Mexican miner Gabriel Maldonado, who purchased the mine). In 1880, he became the Superintendent of the famed John Mackay and James Fair silver mining interests. Mackay, Fair and James Flood were known as the Bonanza Kings (aka Silver Kings) who all became multi-millionaires. Lyman became a lifelong friend of Mackay and went on to run a number of mines under his control, including the Ophir, Sierra Nevada, Union Consolidated, Consolidated Virginia, Gould & Curry and other mines. Silver mining in Nevada began in 1858 with the discovery of the Comstock Lode, the first major silver-mining district in the United States. The Comstock Lode has been mostly inactive since the 1920s. The state is now known as the "Silver State." Lyman also dabbled in politics, being elected to the Nevada State Assembly in 1873 representing Armsby County. From 1885-89, he represented Storey County in the Nevada State Senate. Evan Williams was a Nevada political leader and prominent figure in Nevada mining and milling for 35 years. Born in Wales and came to Nevada as a young man where he opened a butcher shop. He married Dora Foster in Virginia City, Nevada in 1868 and they had three children, Mabel, Enid and Evan Jr. He worked as an accountant at the Crown Point Gold & Silver Mining Company. Superintendent of the Mexican Mill, Superintendent of the Nevada Mill & Mining Company and President of the Bullion Exchange Bank in Carson, Nevada. The Bullion & Exchange Bank acted as a clearing house for other banks in Nevada for bullion, coin, scrip, drafts, checks, bills of exchange and other valuables. Williams was embroiled in a major investigation when a shortage of $60,000 in mining money was discovered. The Bullion Bank was accused of secretly depositing bars of bullion stolen from the shareholders of mines in the Comstock Lode. He was business partners with United States Senator John Percival "J.P." Jones (Republican- NV) in the Comstock Mill & Mining Company. Williams later sued Jones over a series of business transactions. He was elected to the Nevada State Senate in 1885 and in 1889 became the body's President pro Tempore. He served until 1891. His name was bandied about in 1889 to be a candidate for Governor, but he declined to run. He died in San Francisco while being treated for cancer. Make sure to read my posts on Nevada Governors C.C. Stevenson and Henry Blasdel, both of whom are buried at Mountain View Cemetery. His daughter Enid was an accomplished pianist, who was killed in a stage coach accident at age 31. She was vacationing in Blairsden, Nevada with her mother when the horses of her coach were frightened, hurling her from the coach onto the rocky roadway where she fractured her skull. She is also buried in the family mausoleum. 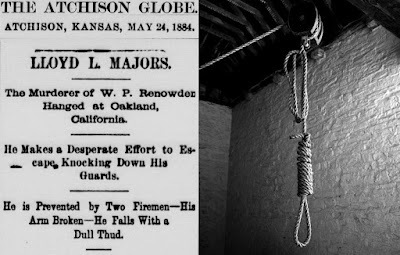 Lloyd Majors was the first man to be legally executed in Oakland and the third legal hanging in Alameda County (the other two being in San Leandro). Majors was executed after being convicted as the principal suspect in the double murder of a "wealthy, old bachelor" named William Renowden and a Canadian named Archibald McIntyre. Majors was born in Garfield, Ohio and graduated Ann Arbor College in 1870 and began practicing law shortly thereafter. After practicing law for four years he became a Methodist minister before moving to California and buying a saloon in Los Gatos. He became a popular citizen in the small town, being elected Foreman of a lodge of United Workmen and being named Grand Marshal of their Fourth of July parade. His saloon, which was struggling to make money, burned to the ground. It was later learned that Majors carried a large insurance policy on the business. He used the insurance money to buy a 40-room hotel, but struggled to financially complete the construction. In February1883, he announced that he entered into a partnership with Joseph Jewell, a painter and regular at the saloon, who claimed he had become heir to a fortune and would provide the money necessary to complete the hotel. Jewell and Majors were then seen hanging out with a guy named John Showers and acting "suspiciously." They showed up at Renowden's cabin after spending the day drinking whiskey, claiming to be lost hunters in need of directions. Renowden was a recluse who allegedly buried his money near an isolated cabin. As Renowden walked the two men to the road, he was told to his put his hands in the air. McIntyre ran out of the cabin to the man's defense, but was shot by Jewell. The men hit Renowden on the head with a pistol and dragged him back to the cabin. When he refused to tell the men where he hid the money, he was doused with turpentine and set on fire. The cabin was burned to the ground and the bodies of Renowden and McIntyre were found at the site. It was subsequently learned that Majors had made inquiries about Renowden's habits and wealth, even visiting different banks at San Jose in an effort to learn if Renowden had any money on deposit. Jewell and Showers were allegedly paid $5 and a given a bottle of whiskey to participate in the murder. 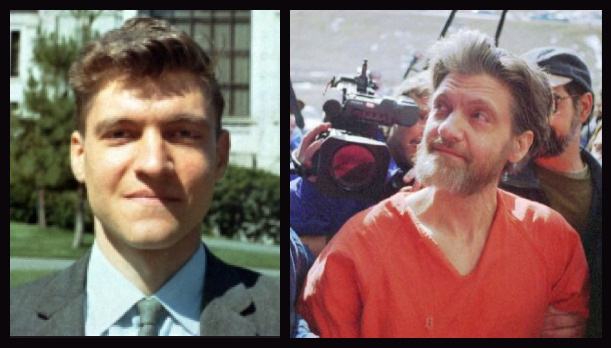 The three defendants were tried in San Jose for the murder of Renowden, with Jewell being sentenced to hang and the other men sentenced to San Quentin for life. Jewell later made a full confession and implicated Majors as the main conspirator. Seventeen days after he was sent to San Quentin, Majors was ordered back to court and sentenced to hang. Governor George Stoneman delayed his hanging and Majors appealed to the California Supreme Court, which denied his appeal and ordered him to be executed. After his conviction and sentencing to be hanged, Majors sought the consolation of religion and maintained his innocence. He told J. B Renowden, a brother of the victim, "You may draw my life's blood from my arm and with this pen I will write my innocence of all connection of the crime in my own blood. " His hanging became a public sensation, as 400 people gathered in the jail yard to view the execution. News accounts say he was hanged at "twelve minutes past 12 o'clock" and that "his neck was clearly broken" after the bolt was pulled and a "dull thud" was heard. The crowd broke out in jeers and cheers. The body was cut down and placed in a coffin for delivery to relatives, eventually making it to Mountain View Cemetery after no relatives claimed the body (his wife was apparently too ill). 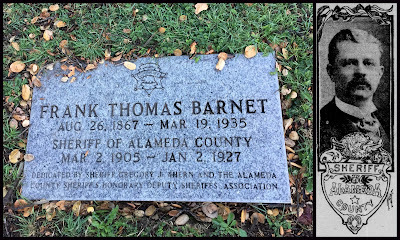 Besides his widow, Majors left behind two little boys named Archie and Abie, who lived in Oakland and according to news accounts grew up to be "murderous bandits." Fifteen years after the hanging, John Showers claimed that Majors was innocent and was convicted on his false testimony. Edward Tompkins was an attorney, University of California Regent and State Senator. Tompkins was born in 1815 in rural Paris Hill, New York. Tompkins enrolled in Union University in Schenectady, NY in 1831 and joined the Sigma-Phi Society. Tompkins graduated, earned a law degree at Hamilton College, and practiced law in New York City and later Binghamton, NY as a partner to Daniel S. Dickinson. Tompkins married a Quaker woman, Mary Cook, from Bridgeport, Connecticut. She died several years later. Tompkins moved to San Francisco, California in 1859. Standing atop Telegraph Hill, he looked around at the beautiful panorama and declared, "This shall be my home!" He soon found employment at the law firm of Halleck, Peacy & Billings, before being a co-partner with the firm Havens & Belknap. He later formed his own firm with his son. In 1861, Tompkins married Sarah Haight, the half-sister of future California Governor Henry Huntly Haight. She was twenty years younger than Tompkins's. They built a home on the banks of Lake Merritt in Oakland. In 1868, he purchased what became the Dunsmuir Estate in Oakland. The property was once part of one the largest land grants in California, issued to Luis Maria Peralta. 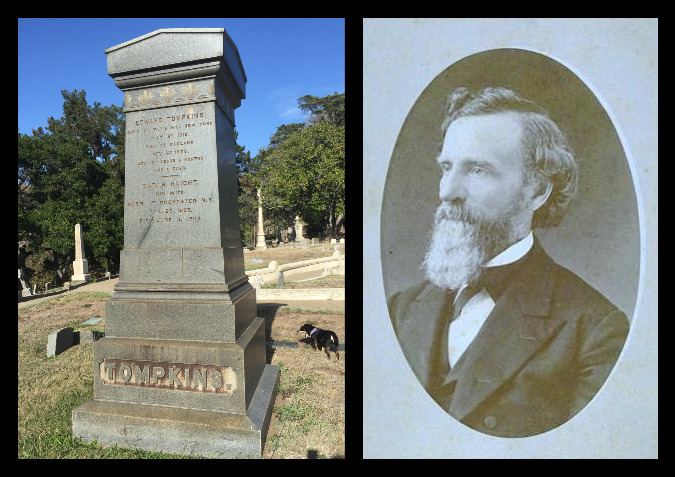 When Tompkins died in 1872 he left the estate to his son, Gilbert Tompkins, an editor of the San Leandro Reporter. 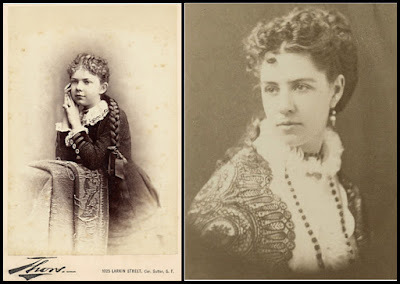 Josephine Wallace (Alexander Dunsmuir's future wife) was a cousin of the Tompkins family and often visited the estate as a child. Tompkins was elected in 1869 to represent Alameda County in the California State Senate and became Chair of the powerful Judiciary Committee. In 1870 Tompkins, a self-described Constitutional Democrat, spoke in favor of ratification of the 15th Amendment and voted against a California Senate resolution opposing California's proposed ratification. The Fifteenth Amendment to the United States Constitution prohibited the federal and state governments from denying a citizen the right to vote based on that citizen's "race, color, or previous condition of servitude." He is remembered today for endowing the Louis Agassiz Chair for Oriental Languages and Literature at the University of California where he had been elected to the board of regents. As a state senator Tompkins argued for the creation of the University of California as recommended by the previous governor, Frederick Low. The charter creating the university (then only an agricultural school) passed on March 23, 1868 and Tompkins was elected to a four-year term on the Board of Regents of the University of California later that same year. Tompkins endowed the school's chair on September 18, 1872 only months before he died. His initial gift of 47 acres of land, which sold for $50,000 ($984,306 in 2015), was evaluated on June 30, 2008 at more than $5,700,000. Abraham Lincoln established the first University of California endowment when he signed the Morrill Act on July 2, 1862, thereby establishing the land-grant colleges and universities—including the University of California. Tompkins said that he felt "deeply the humiliation" of seeing Asian students go to the East Coast "in search of that intellectual hospitality that we are not yet enlightened enough to extend to them. Tompkins's interest in Oriental studies grew out of his anticipation of expanded trans-Pacific commerce. Upon Tompkins's death, his position on the board of regents was filled by his brother-in-law, former Governor H.H. Haight. Some of Tompkins's letters are archived with papers of his relatives at Bancroft Library. 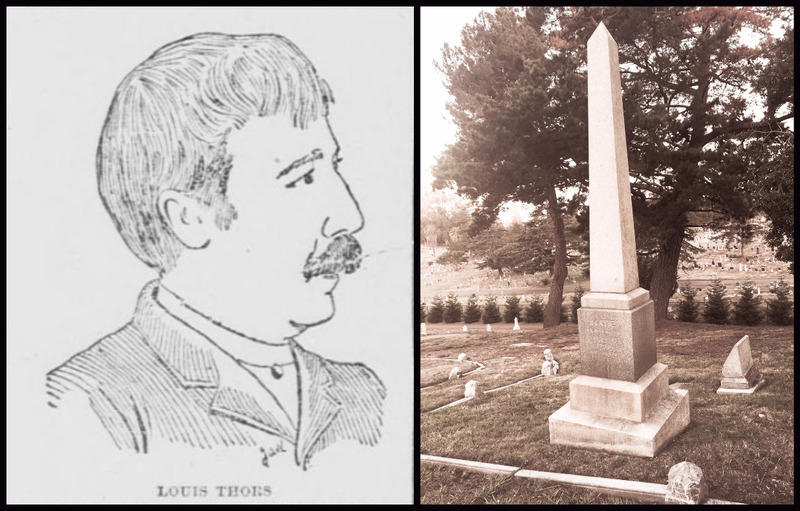 Tompkins also had a role in the creation of Mountain View Cemetery. Along with Rev. 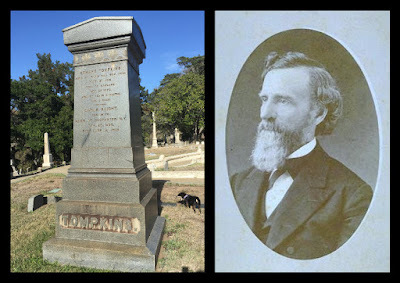 Isaac Brayton and businessman Peter Thompson, Tompkns had acquired ownership and responsibility for Oakland Cemetery, which was located near Lake Merritt. Brayton owned land well out of town, which he believed to be a perfect place for new cemetery. The three men turned to Samuel Merritt, who lived on Madison Street, just a few blocks south of Oakland Cemetery. On December 26, 1863, Merritt called a pair of meetings that led to Brayton's property becoming Mountain View Cemetery. 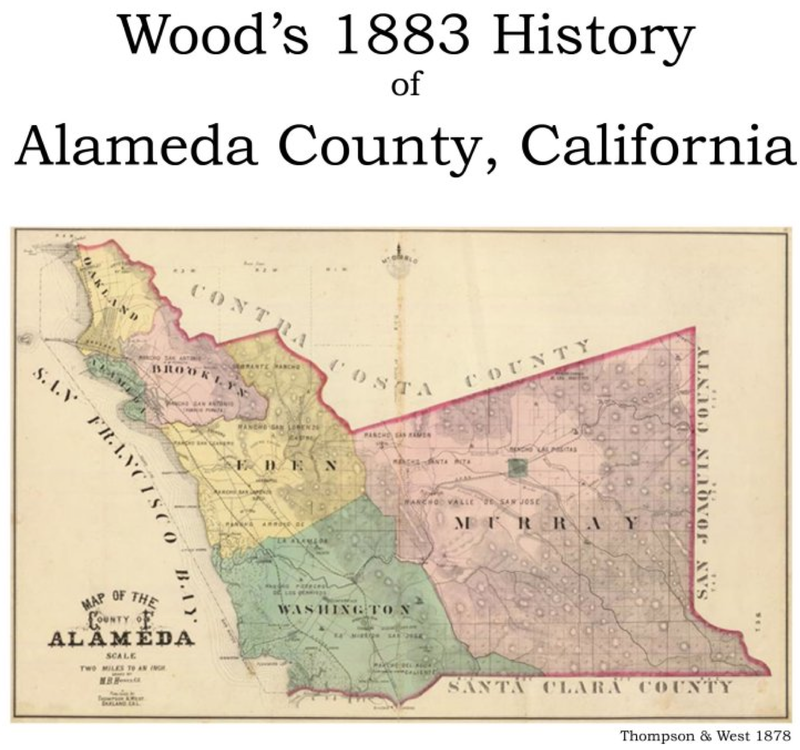 Sources: Wikipedia, University of California at Berkeley archives (Bancroft Library), Historic American Landscapes Survey of the National Park Service, History of Alameda County: Volume 2. Louis Thors was one of the most famous photographers at the end of the 19th century and beginning of the 20th century. 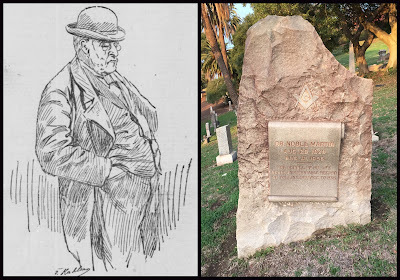 He is one of many prominent photographers buried at Mountain View Cemetery, including daguerreotpists George Dornin and William Shew, bas-relief specialist Isaiah Taber and Edgar Cohen, who documented much of the 1906 earthquake. 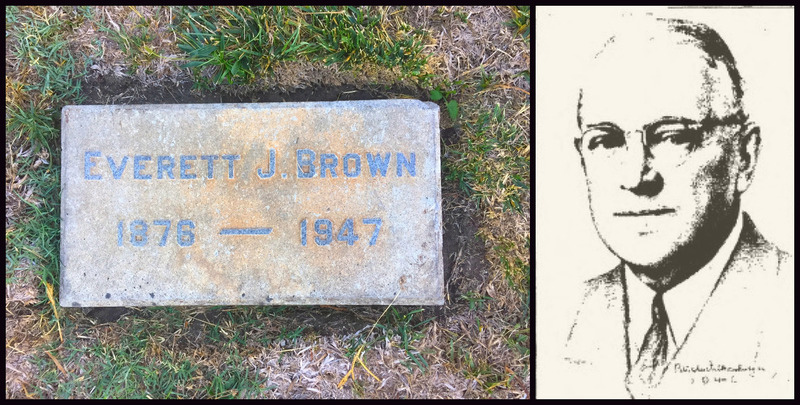 He also took one of the most famous pictures of fellow Mountain View Cemetery denizen, Ina Coolbrith, California's first Poet Laureate. Thors was born in Amsterdam, Holland in 1845. He claimed to be of both French descent and a descendant of Dutch Golden Age painter Gerrit Lundens. He studied engineering, draughtsmanship, and cartography in France and served as a Merchant Marine. After his family suffered a financial crisis in 1866 he decided to come to California a few years later. After dabbling in real estate and renching, he landed work as a retoucher with the aforementioned Isaiah Taber in 1872-73. He later worked for Thomas Houseworth's studio in 1874, and Bradley and Rulofson Photography in 1875-78, the major photographic studios in the city at the time. He set up the Thors Photographic Company in San Francisco at 1025 Larkin Street, where it operated from 1880-89. His studio later moved to 14 Grant Street and eventually to the Phelan Building on Market Street. His first wife Katherine "Katie" worked at his studio until her death in 1889 from complications related to neck surgery. He later married Gertrude Thors, who was a noted photographer in her own right. "The apartments, specially built after original designs by Mr. Thors, are perhaps the most complete and the most elaborate this side of the Rockies, or, in fact, In the entire country- Everything from the magnificent reception room down to the minutest detail of the adjoining rooms is perfect and far and beyond the Slightest fault. On the lower or main floor of the new gallery are situated the reception room, directly connected with the street below by a special elevator erected for the purpose; five dressing rooms, each provided with every facility for which It has been designed; two dark rooms, an office, an artist's room, a finishing room, a fire proof negative vault in which are stored over 120,000 negatives, and a retouching room. All of these apartments are spacious, and contain every requirement for perfect work. The reception room is probably the most elaborate of its kind ever designed. It is over a hundred feet square, twenty feet high, with an artstained glass dome directly in the center over twenty feet in diameter. The decorations consist of a magnificent contrast of Egyptian red and black, the wall frescoing being of the former tint, and the heavy woodwork of the latter. On the upper floor are situated the print or fixing room, a tone room, a silver room, a special room for producing enlargements, and the main printing room, which extends a distance of thirty-eight feet, being covered overhead entirely of glass." Thors became well known for using the Nadar process, which was an application of photogravure to portraiture in photography and is noted for its softness and tone. Thors was awarded the bronze prize at the Paris Exhibition in 1889 for mastering this technique. He became particularly noted for his photographs of women and specifically famous actresses of the day. He was known for viewing an actresses performance before shooting her portrait and prohibited the use of makeup. He was highly sought after by the elite ladies of high society to sit for their portraits. 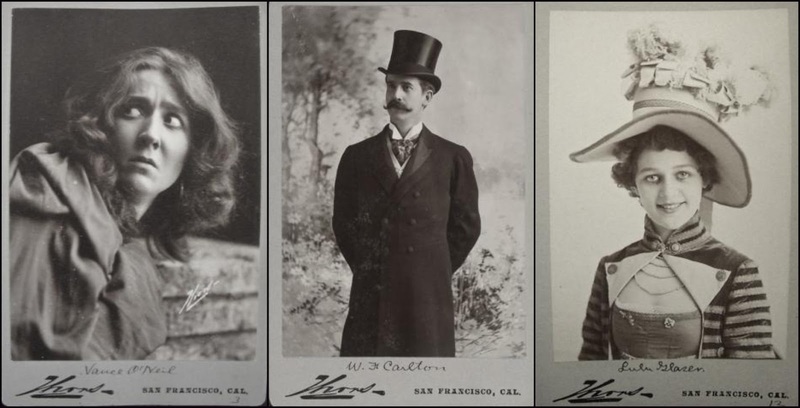 He was elected Vice-President of Benjamin Falk's Copyright League, the national lobbying organization on behalf of photographers' property rights, and in 1904 was elected president of the California Professional Photographers Association. After the devastating earthquake of 1906, Thors left the city and worked in St. Louis for two years as a traveling salesman in the western United States for the Artura Paper Company before returning to California in 1908. He reopened his studio but died of cancer two years later. 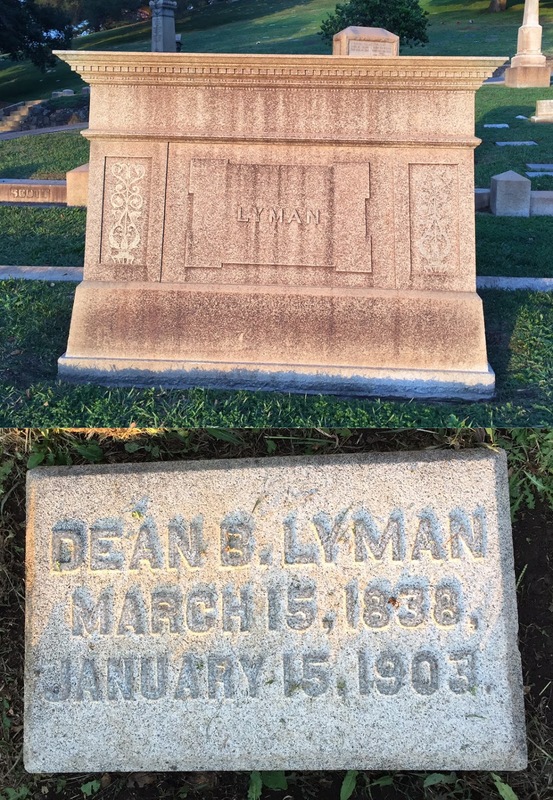 He was buried in the Plot 26 at Mountain View Cemetery, which he bought for his first wife Katie. Sources: Sacramento Daily Union, San Francisco Call, California Historical Society, University of New Hampshire archives, Oakland Tribune. On April 17, 1899, Everett Brown was part of the first group to steal the axe awarded to the winner of the Cal-Stanford football game. The other participants were (Billy Drum, Archie Cloud, Jerry Muma, Clint Miller, Coleman Broughton, Jimmy Hopper, Fred Dorety, Charlie Pringle, and Harry Morrison). The legend goes that Stanford students came to a Cal-Stanford baseball game with a 15-inch lumberman axe and threatened to "give it to the Blue and Gold in the neck." After the game, Everett Brown and his co-conspirators stole the axe and put it under lock and key in a safe-deposit vault at the First National Bank. For the next 31 years, the axe stayed in Berkeley as a prize of conquest. In 1930, twenty-one Stanford students plotted to take back the axe from Cal. This group became known in Stanford lore as the Immortal 21; Cal partisans call them the Immoral 21. After the rally, four Stanford students posing as photographers temporarily blinded Norm Horner, the Grand Custodian of the axe, with camera flashes. In the subsequent scuffle, the Stanford students grabbed the axe while several others disguised as Cal students tossed a tear gas (or smoke, depending on account) bomb at the Cal students who guarded it. The axe was taken to one of three cars which sped off in different directions. Several other Stanford students, who were disguised as Cal students, further delayed attempts to recover the axe by organizing a search party away from the direction of the getaway cars. Although several of the raiders were caught, the zxe made it back to Stanford where it was paraded around the campus. In 1933, both sides agreed to designate the axe as the annual trophy to be awarded to the Big Game's winner; in the event of a tie, it would be kept by the side already possessing the Axe. Brown graduated from Cal in 1898 and from Hastings School of Law in 1901. He went on to become an attorney. 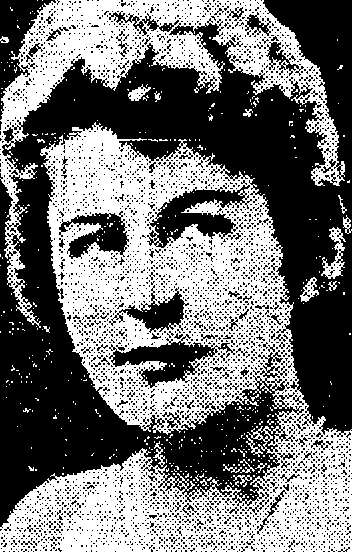 Alameda County District Attorney and appointed as Alameda County Superior Court Judge by Governor James H. Gillette in 1908. During his time on the bench, he created the Juvenile Court Division. He retired in 1920 from the bench. From his retirement to his death he was a partner in the law firm Brown, Rosson & Berry. He is buried in the plot of his grandfather Frederick Delger. His mother was Matilda Brown, Delger's daughter. She was the founder of the King's Daughters Home, which Judge Brown dedicated on November 24, 1912. You can read about it HERE. 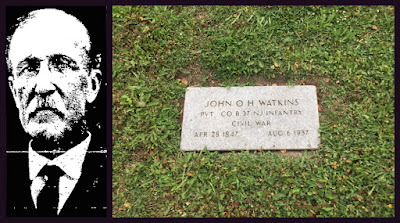 John Oliver Halstead Watkins was born in Mendham, New Jersey on April 28, 1847 to John and Phoebe Pitney Watkins. On January 19, 1873, he married Amelia Augusta Pinney, with whom he had two daughters. His wife died in 1921. His father was killed in the Burnside Expedition of the Civil War at age 39 in New Bern, North Carolina on December 13, 1864, which the Union Army had taken from the Confederates two years earlier. 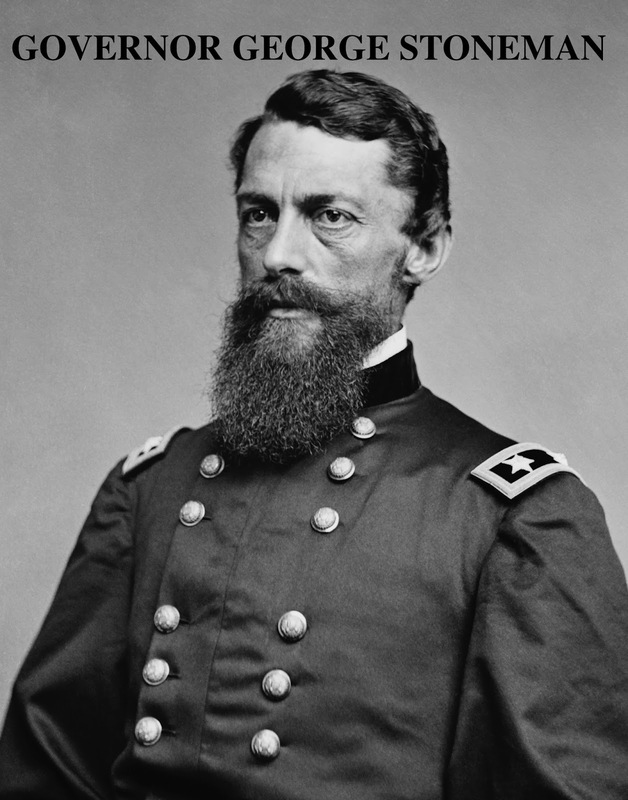 His brother died in the Battle of Williamsburg under General George McClellan. There were 2,283 Union casualties and 1,682 Confederate casualties. Watkins enlisted with Company B of the 37th New Jersey Volunteers at the age of 15 against the protestations of his mother, who had already lost her husband and other son. The regiment was under the command of Colonel Burd Grubb and contained more than 700 men. 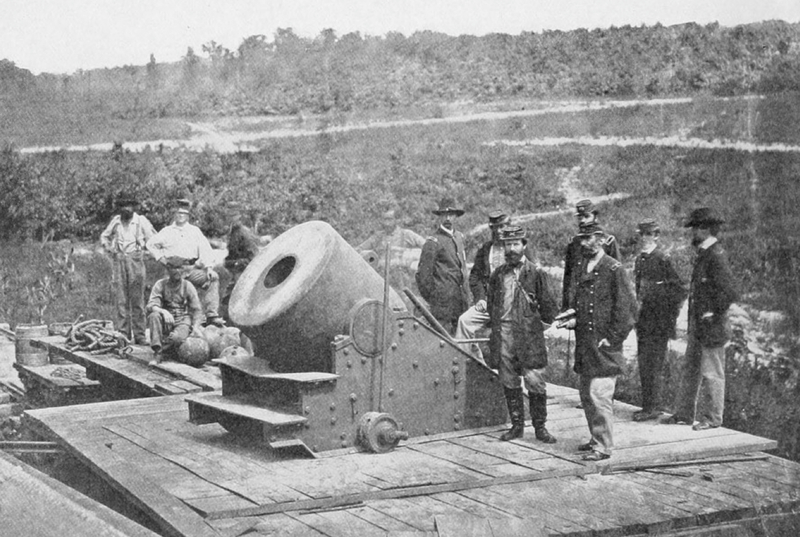 They were put to work unloading supply trains near the Appomattox River. They were later asked to lend support on the front lines at the Siege of Petersburg where 37 members of the regiment were killed. At the time of his death in 1937, there were only 18 Civil War veterans remaining in Alameda County. His grave remained unmarked until April 28, 2013, when two chapters of the Sons of the Union Veterans, Wright Camp 22 and Pleasanton Camp 24, obtained a marker from the United States government and held a ceremony at Mountain View Cemetery. Watkins came to California after traveling around Cape Horn aboard the City of New York in 1867. The voyage took 150 days. Upon his arrival, he was appointed to a position in the paymaster's office at Mare Island, where he remained employed for 33 years. 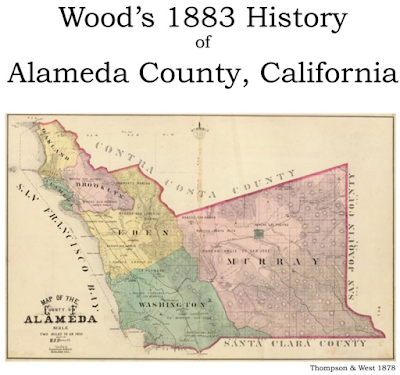 He also owned a strip of land in Oakland extending from Piedmont Avenue to Moss Avenue. His uncle Reverend Isaac Brayton, was a prominent Oaklander, who ran the Brayton School and sold 200 acres to the trustees of Oakland’s newly formed Mountain View Cemetery. Watkins was also the cousin of United States Supreme Court Justice Mahlon Pitney on his mother's side of the family. Pitney authored the majority opinion in New York Central Railroad Co. v. White, which upheld a New York state workman's compensation law and laid the foundation for the expansion of these programs nationwide. Watkins' health began to fail a year before his death after he fractured his arm in a fall from a street car. The injury was so severe it necessitated his arm being amputated. He was bedridden until his death. His funeral services were led by the Grand Army of the Republic and the Daughters of Union Veterans of the Civil War. "LIves of the Dead" is now a book. 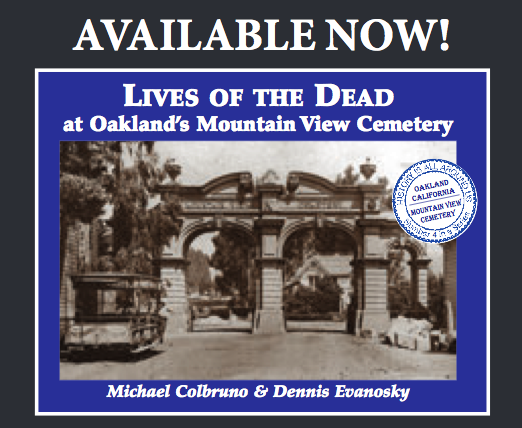 In celebration of the150th anniversary of Oakland's Mountain View Cemetery, the Alameda Sun press has released a book version of "Lives of the Dead." 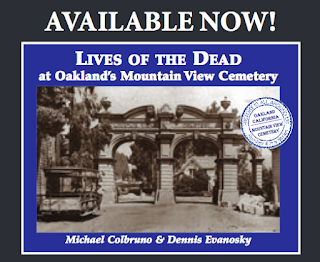 The book was co-authored by noted historian Dennis Evanosky and Michael Colbruno, the "Lives of the Dead" blogger. Both men are also docents at the cemetery and lead regular tours. 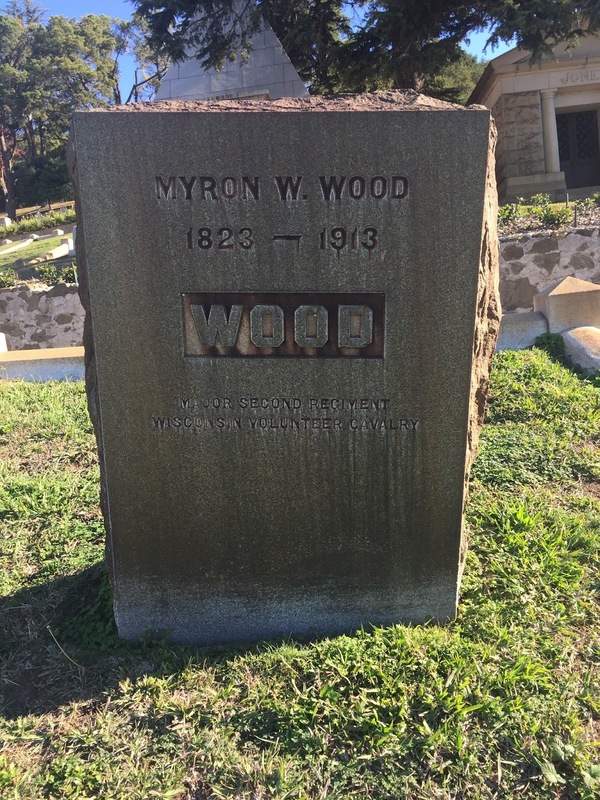 The book covers many of the noteworthy people interred at Mountain View Cemetery, including stories about the cemetery founders, early Oaklanders of note, famous photographers, notable African-Americans, famous pioneers in various fields and a field guide to many of their homes. One of the more unusual burials at Mountain View Cemetery has to involve Dr. Ignacio Herrera y Cairo, the former Governor of Jalisco, Mexico and Grand Master of the Masonic Veteran Association of the Pacific Coast. Dr. Ignacio Herrera y Cairo was an arch-enemy of the Catholic Church for having imprisoned a group of Carmelite friars who he maintained were plotting against the government. The Catholic Church never forgave him and Herrera feared for his life from that day on. In 1858, a group of men showed up at his ranch and exacted their revenge. Anticipating his eventual death, Herrera asked his fellow Mason brothers that if he was ever murdered they should preserve his heart to show that he had the heart of a man who had died for his devotion to Masonic principles. Thirty-five years after his murder, his heart was transported from Mexico to Oakland by his sister Rosalinda Labastida de Coney and kept at the Masonic Temple. When his heart was ready for burial thousands of Masons gathered at the gates of Mountain View Cemetery and along with four Knights Rose Croix escorted his copper casket, draped in the Mexican flag, to its final resting place. The casket with the heart was placed beneath a granite monument where Rosalinda ensured that all of his final wishes were properly honored. The Masonic Choir sang the "Martyr's Hymn" and Edwin Sherman delivered a eulogy that blasted the Catholic Church and charged them with his murder. When she died in 1897, Masons turned out in droves for her funeral, with each person placing a red rose on her grave. Her foster son, the acclaimed artist Xavier Martinez designed the plaque that graces her grave. Some of Mountain View Cemetery's most iconic structures were designed by Italian immigrant Fulgenzio Seregni who is almost forgotten to time. Famous architects like A. Page Brown, who designed the Crocker Family Mausoleum, are far better known to architecture and history buffs, but the most photographed structures at the cemetery are works of Seregni. Fulgenzio was born, raised and educated in Milan, Italy. He worked for seven years for a Russian prince from whom he learned marble cutting. In 1851 he immigrated to New York City. After traveling across the Isthmus of Panama in 1858, he settled in San Francisco where he taught penmanship, drawing, and writing Pacific Business College for the next 18 years. He then established a marble business in San Francisco with business partner Ettore Bernieri, which produced some of the finest statuary on the West Coast. Seregni & Bernieri had studios in San Francisco and Carrara, Italy. Their work included the alter for Archbishop Riordan at Holy Cross Church in San Francisco, the alter at St. Brigit Church in San Francisoco, the marble alter at the Memorial Church at Stanford University and the pedestal for the Goethe-Schiller monument in Golden Gate Park. On the East Coast, he designed monuments for Jay Gould, Thomas Scott, Judge Asa Parker, Rhode Island Governor Seth Pedelford, as well as the Firemen's Monument. On the West Coast, he designed monuments honoring Louis Strauss, Governor Henry Huntly Haight, San Francisco Mayor Thomas Selby and Nevada Senator William Sharon. Seregni & Bernieri were finalists for the design of a monument honoring great Californians which now sits between the San Francisco Library and Asian Art Museum. The monument designs commemorated the transition of California from the Spanish to the Americans, and featured James Lick, John Fremont, General John Sutter and Commodore John Sloat. The firm submitted two proposals, but they lost out to a design by Frank Happersberger. The Colton mausoleum, which is guarded by two Greek sphinxes, was designed by Seregni in the basic Greek Revival Temple style with Corinthian columns and pilasters. Although sphinxes and Greek Revival Temples are considered pagan architectural forms they continue to be among the most popular types of funerary architecture. 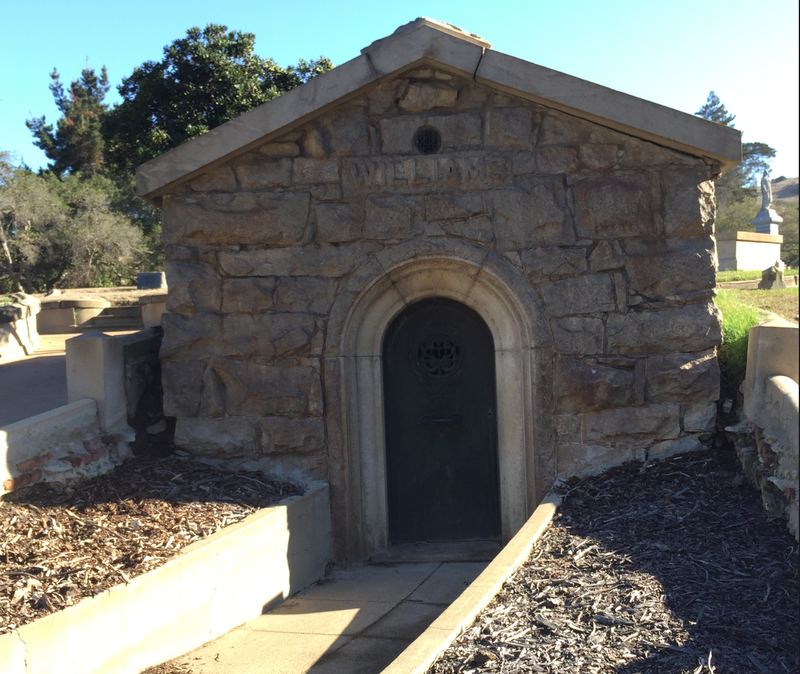 According to historian Doug Keister, Mrs. David D. Colton had this mausoleum built for her husband following his death in 1878. As a statement of her continuing grief, she had the mausoleum built in a location that would be plainly visible from her Nob Hill residence across the bay in San Francisco. Frederick William Delger and his family rest in and around a grand Gothic Revival aediculum (or small mausoleum), which sits right next door to Charles Crocker on Mountain View Cemetery's Millionaire's Row. Delger, who is considered Oakland's first millionaire, made his fortune in real estate and the retail shoe business. At one time he had three streets in Oakland named after him, Frederick St., William St. and Delger St. 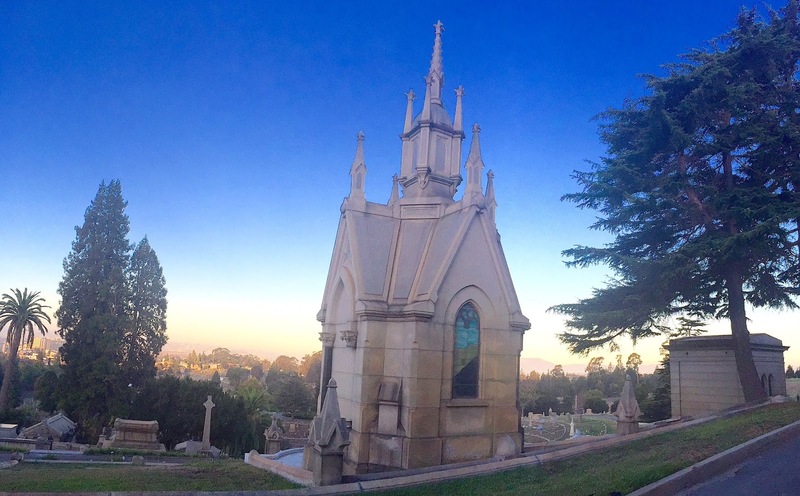 The Crocker and Schmidt angels have become the unofficial icons of Mountain View Cemetery. 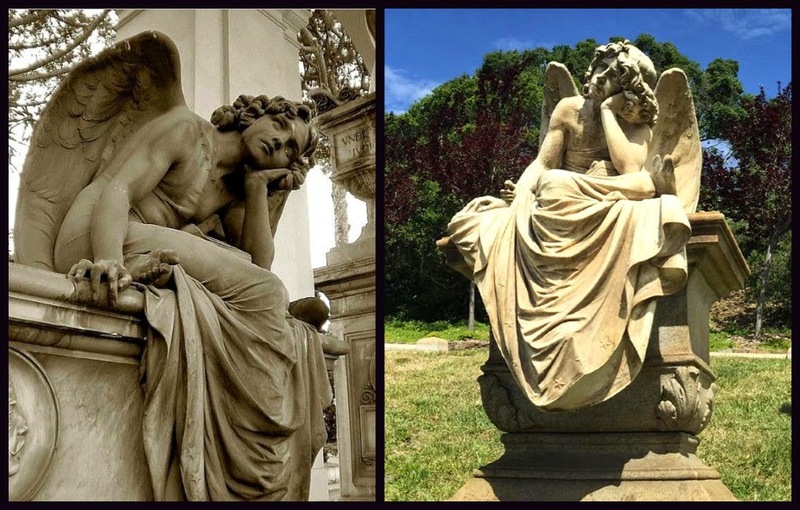 These angels were likely known to Seregni from angels that he had seen at a cemetery in Carrara, Italy designed by Giulio Monteverde (1837-1917). The figure is known as the Angel of the night, with the most famous version at the grave of Primo Zonca at the Verano Monumental Cemetery in Rome. Other similar statues exist in cemeteries in Genoa and Madrid. These melancholic androgynous angels, sitting on a grave with, their wings folded back and looking to the sky, represent an untimely death. There is a drawing of in the cemetery files of a sketch of the angel, which hints that it may have been copied from another monument. Albert Schmidt, a prominent real estate developer, erected this angel in memory of his daughter who died young from a bout with acute appendicitis. Henry Crocker ran successful stationery and book-binding businesses in Sacramento and San Francisco. Other Seregni & Bernieri monuments at Mountain View Cemetery are those designed for the families of A.K.P. Harmon and James Latham. The angel at the top of the Latham monument glances downward awaiting the arrival of the departed.